SOLD WAS: $52.50 NOW: $30.00 I love these earrings! Notice how the clip mechanism is a detailed hand. Large earrings are so popular now. Why look like everyone else. Why not be unique with this pair of attractive hoop earrings. 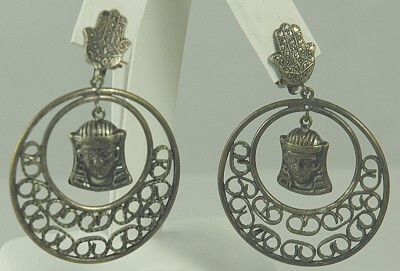 Open metal work and the pharaoh dangle at the center complete the design. The metal appears to be brass and it has wonderful patina. Condition: Excellent vintage. Measurements: Total length: 2 1/4" with a 1 1/2" drop from the clip finding. 1 1/2" wide.